This combination of large and small professional quality tools is an excellent foundation set for anyone serious about woodblock printmaking. Use the large 15mm Hira To (chisel) to carve Kento registration marks or to smooth down cleared areas. The 18mm Maru To (u-gouge) is ideal for clearing away unwanted wood from large areas of the block. The Futatsu Wari Hangi To (knife) is the traditional tool used to outline areas of the block you want to keep, while the three Komasuki (u-gouges) are used to clear wood away or create interesting textural patterns. The Aisuki is designed to remove the peaks left behind by the Komasuki. Its rounded tip glides easily through the wood. These hand-forged Japanese tools have been professionally sharpened and meticulously honed and are ready for immediate use. For protection the seven tools come in a 21" long x 12" wide canvas tool carrier with extra pockets to hold more tools. 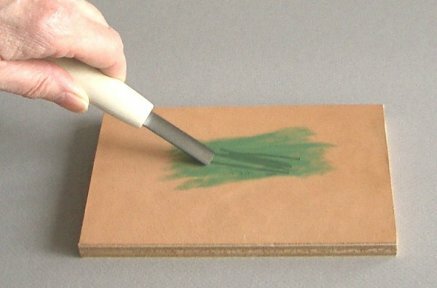 For more information about Futatsu Wari Moku Hanga To (two-part handle woodblock carving tools), please click here and for more information about Josei Moku Hanga To, click here. Available with either a left- or right-handed Hangi To. 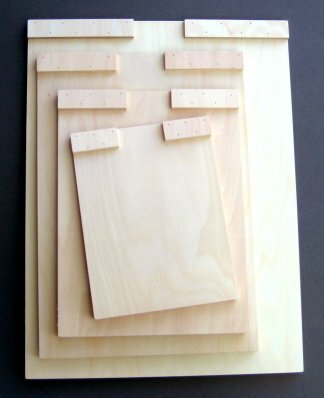 If purchased individually, the price for the tools and carrier would be $358.33. Sorry, no substitutions. *Currently out of stock. More tools should arrive in April/May, 2019. If you order this Set, it will be placed on backorder and shipped as soon as possible. There is no additional shipping charged on backorders shipped within the U.S. Thank you for your patience.